A speedy way to give your main dish meal a spring touch. Quick pickled onions are mellow and tart with the fresh taste of lime juice and just a hint of savoury sweet from molasses. 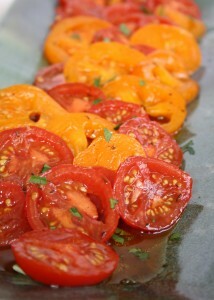 They’re just the thing for an early spring barbecue or any fresh-tasting meal that has a hint of summer. We love them tucked in with fish tacos and as a topper on turkey burgers. They’re great tossed into salads too. Spring arrived yesterday, just like that, with 20 degree weather, a warm breeze and loads of sunlight. That got me thinking about lighter fare, fresher meals and toppers like pickled onions. 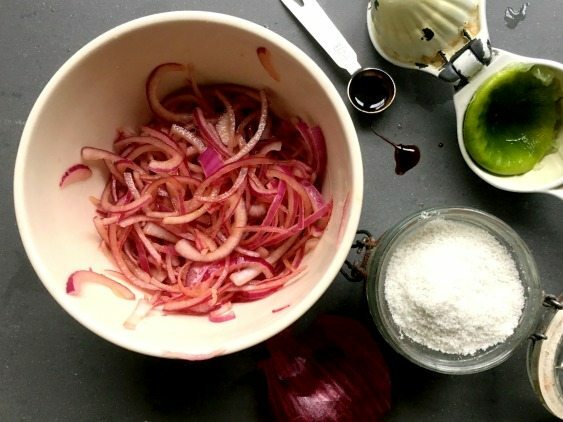 You’ll find that quick pickled onions will suit just about any savoury food you plan to eat between now and the end of August. 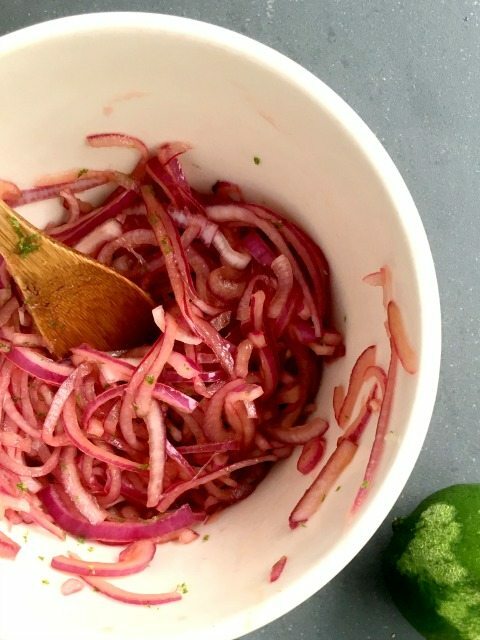 Quick pickled onions are versatile because their flavour has been mellowed by the lime juice and salt. So there is none of that strong onion flavour and lingering heat that you get with a regular raw onion. I’m sharing the recipe as I enjoy it, but feel free to adjust to your tastes buy adding more or less lime juice and molasses. 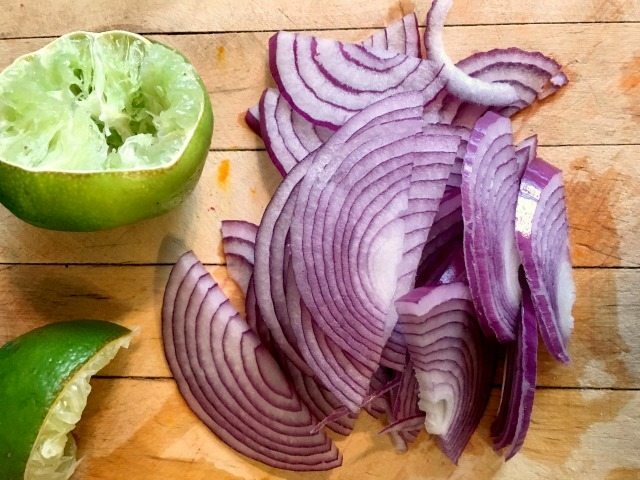 Slice the onion crosswise, as thinly as possible. 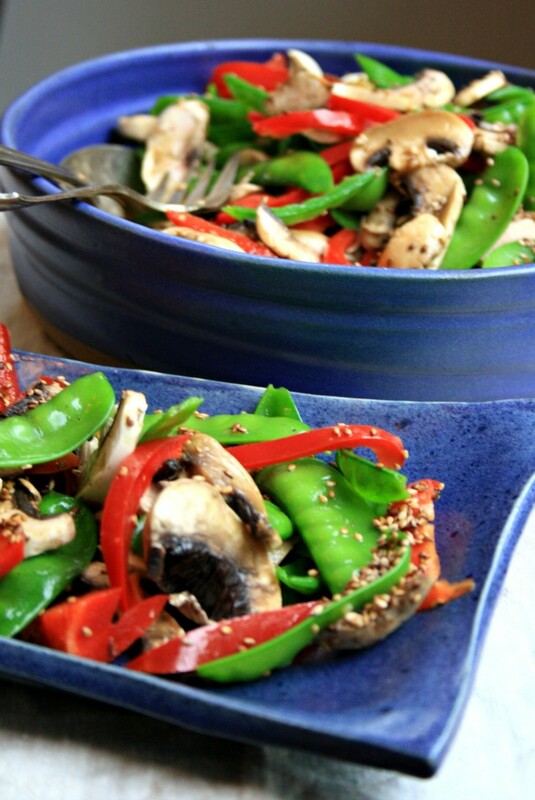 Place in a medium bowl (with room for tossing) and toss with remaining ingredients. Let sit for 20 minutes or so to macerate. Will keep in the fridge for a couple of weeks. 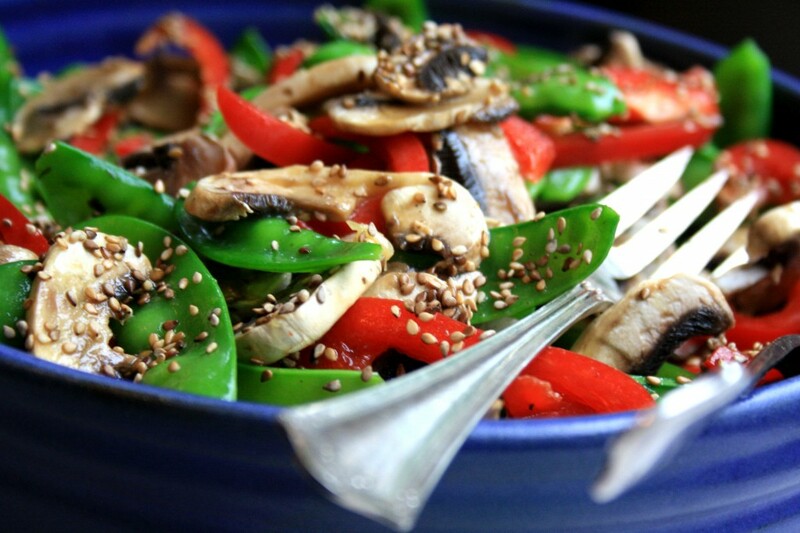 It’s always great to have a stash of salad recipes that venture from the lettuce sort. In fact, a group of friends and I were joking about a potluck I hosted where everyone, everyone, brought a salad. Fortunately they weren’t all leafy green salads. You can make a great summer meal of salads when there’s a good variety of vegetables and textures involved (and you have laidback guests who are enjoying the wine). 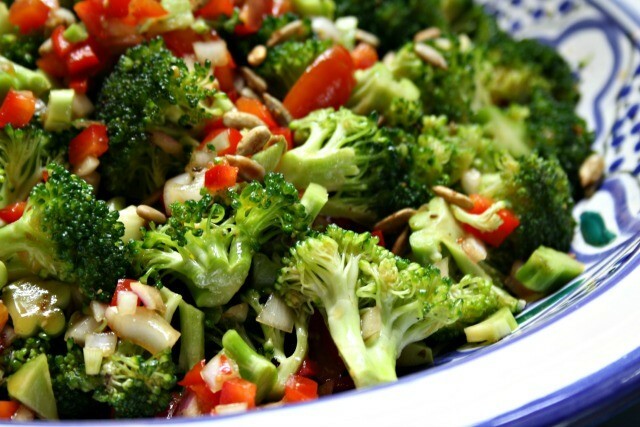 This marinated broccoli salad recipe from my sister-in-law Jane adds great variety to a potluck and is a welcome change from basic steamed broccoli. My mom is a very sharp woman and we were never able to sneak much past her when we were growing up, so for my six siblings and I to succeed with the surprise was a huge accomplishment. Conveniently, we had a big rowing regatta (the re-enactment of the Paris Crew race in Renforth) as a helpful decoy, a way to get mom and dad out of the house and reason enough for my twin brother, a former rower, to come home for the weekend. Another brother who was living in Minnesota was home for a visit too. My brother who was tasked with getting mom out of the house (dad had gone ahead) to make way for the caterer had us all near heart failure when he didn’t arrive at the appointed time. It was not looking good when suddenly, through the kitchen window I saw his car round the corner (practically on two wheels he was in such a hurry). As he and mom drove out of the yard the caterer’s van came up our street. Then, as mom and dad walked along the sidewalk toward their vantage point for the race, another brother and his family (surprise visitors for the party) drove right by, in their distinctive red car. My brother and his wife spied my parents but thanks to the commotion mom and dad didn’t notice. And when mom and dad arrived home from the race to a yard full of cars they still didn’t suspect a thing. They assumed I had invited a bunch of friends over, until mom caught a glimpse of an old family friend through the window. We had the party partially catered and then we all pitched in with extra appetizers and salads. That was probably the last time I made this salad. For years it made the family party rounds and then was somehow forgotten, only to be rediscovered a couple of months ago in and old hand-written cookbook of mine from the early 1990’s. I can’t recall the book it came out of but mom and I can both picture the salad, lovely and bright in a pretty blue pottery bowl on their dining room table. Blanch peas in boiling water for 1 ½ to two minutes. Drain and rinse immediately under cold water. Dry thoroughly. Many dear friends and family who were at that party years ago are no longer with us. It’s a good reminder to celebrate with people who are special to you every chance you get. When I was growing up my mom and dad were day trip experts. Every summer weekend we’d all pile into the station wagon and head off on a new adventure. We did lots of beach exploring, took many ferryboat rides and had fantastic picnics. And we sang, a lot. There’s a lot to be said for getting away as a family, even if it’s just for a day. These little trips were about making memories and mom and dad knew that. Have you ever packed a picnic for nine people? That’s what mom did for these getaways. 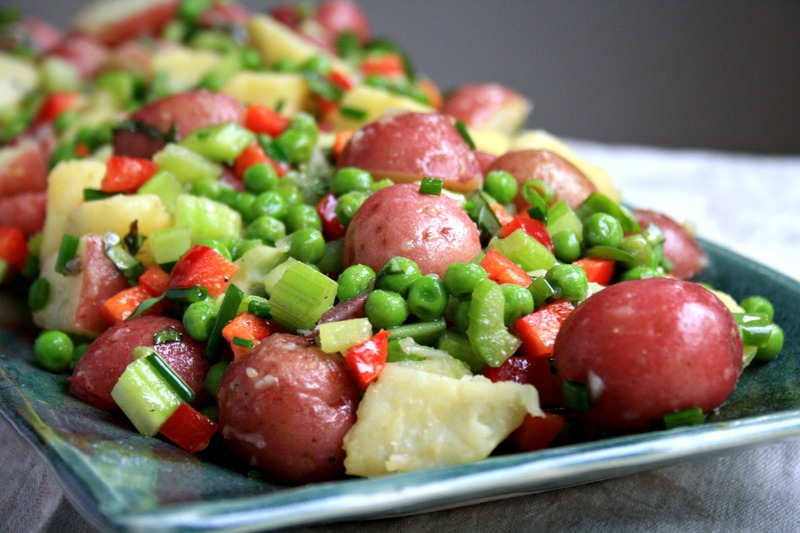 An easy picnic addition was this potato salad recipe from an early 1970’s Red Book magazine. The dressing isn’t mayonnaise-based so you don’t have the same hot weather storage worries. 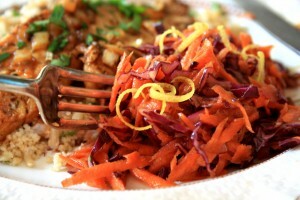 The salad is also loaded with vegetables, so there is more flavour and texture than your regular potato salad. What’s your favourite picnic food? Combine dressing ingredients in a jar and give it a good shake. Cut the potatoes into 1” pieces and boil until fork tender (take care not to overcook). 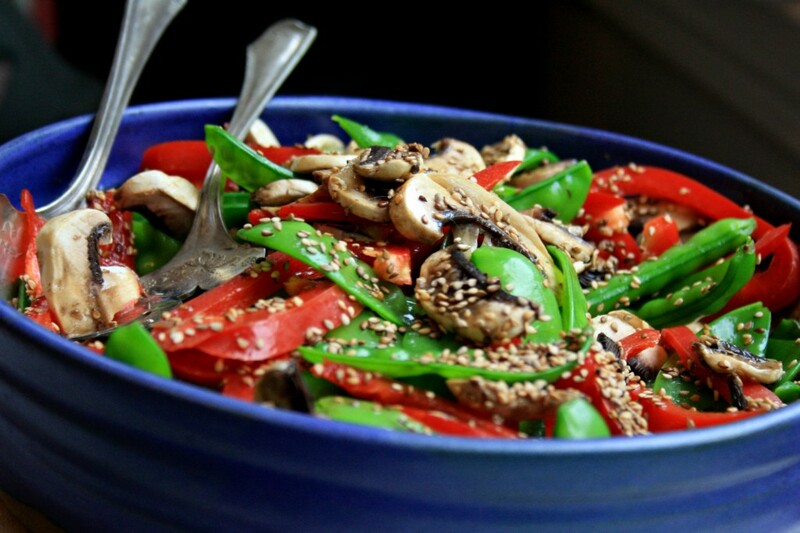 In a large bowl toss the celery, peppers, scallions and herbs with half of the dressing. 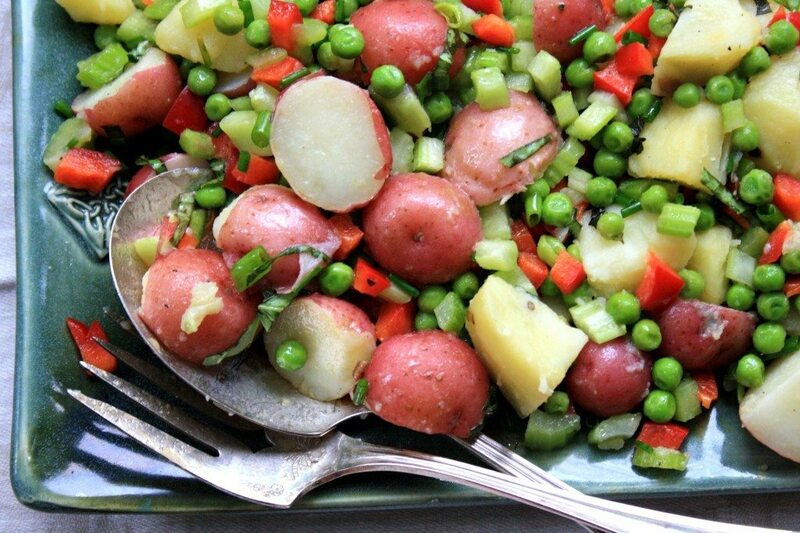 When the potatoes are cooked, drain and immediately add to the bowl of veggies. Add additional dressing, as required, along with the peas. Let rest in the fridge overnight, if you have time.